We spent last weekend with David’s family in the north of Catalunya (Spain) and realised how different our views of the area, the people, the traditions and the food are. We thought it would be a lot of fun and quite interesting to share some insider and outsider tips with you guys and impressions of the area from the point of view of David and myself. A quick bit of background information first. Llançà is a small fishing village on the Spanish coast at some 20km from the French border, close to the Pyrenees, and about a 2-hour drive north of Barcelona. It is part of Costa Brava in the province of Girona, Catalonia. It also happens to be where David was born and bred. I am now visiting the area for the third time and this is my first time during summer. The weather is generally typically Mediterranean with blue skies year round, hot summers and mild temperatures during winter and little rain. There can be strong winds at times however, the sun normally continues to shine. Ok, enough of sounding like a wikipedia entry and more about the important stuff. The people in Llançà, especially David’s family and friends have been incredibly friendly and welcoming despite me speaking very bad Spanish (a work in progress) and no Catalan at all. After my first nerve racking visit to Llanca I already felt part of the family despite the language barrier (my Spanish was non-existent then). David’s parents never made me feel obligated to learn Spanish but I certainly wanted to. To help me practice, David’s mum (affectionately called Mama P.) decided that we would become whatsapp buddies where we only message in Spanish (his parents don’r speak English or German, though his dad likes to show off the few German words he knows regularly). It has been a tremendous help and I now feel confident to write messages without getting David to check them before they are sent. At the risk of stereotyping, this hospitality and friendliness is generally characteristic of the Spanish people. They are full of life and family and friendships are a priority for them. There is no other experience like being in a room with a bunch of Spaniards having multiple conversations simultaneously, talking over each other. Somehow they all understand what’s going on :). If they are able to help a complete stranger they will. Just a week ago I was telling a Spanish colleague of mine that we were heading to Bali in the summer and she very enthusiastically told me she had a cousin in Bali who could help us out. Having a friend or relative help an unknown stranger is not unusual to the Spanish. For those who have spent some time in Spain you will know that the Spanish love a celebration (fiesta) and it is no different in Llançà. They also have a love of food and music which seems to be a part of their soul. Being on the coast and a fishing village, delicious seafood is aplenty. There are some dishes that are found all over Spain but the different provinces also have their own specialities and Catalonia is no exception. Some of my favourites include: Crema Catalana (Spanish version of creme brulee); Coca de Llardons or Coca de Crema (layers of puff pastry with a creamy, custardy centre); hundreds of tapas dishes (small portions made for sharing, yet more evidence of their love of food and socialising); and of course a refreshing glass of sangria (cold red wine with fruit). This weekend we experienced a medieval fair in the small village of Llançà, due to its medieval history. The whole town came out to enjoy each other’s company, some good food and wonderful weather. There was traditional medieval music, people dressed in costume and a plenty of activities and stalls to occupy the young and not so young. 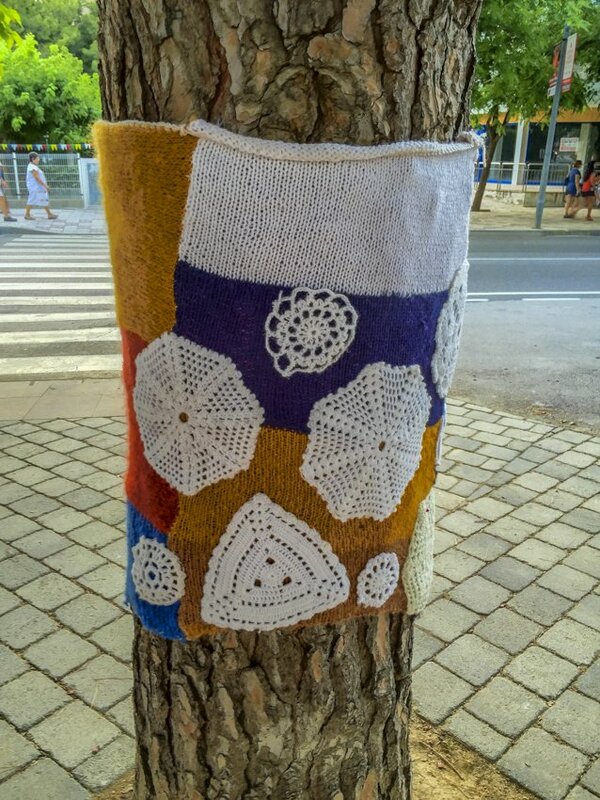 This sense of community was also evident in the main park in the town where the town knitting/crocheting group had gotten together and knitted hanging decorations and little blanket-like embellishments to some of the trees. My initial reaction was that it was a bit of a strange thing to do but the more times we walked through that park the more I appreciated their sense of community, not only to create a group with people of similar passions but to also share this with the rest of the town. Catalonia also has, what can only be described as, its own unique traditions, two of which appear around Christmas. If you look closely at a nativity scene at Christmas time in Catalonia (and sometimes in other parts of Spain, you will spot an extra character called “el Caganer” (literary translated as “the Shitter”). If you’re lucky you may also find “el Pixaner” (“the pisser”). No-one has ever been able to explain to me why on earth these characters exist. It provides endless amusement to me that they even exist and of course the first thing I do when I see a Spanish nativity scene is look for el Caganer and el Pixaner. 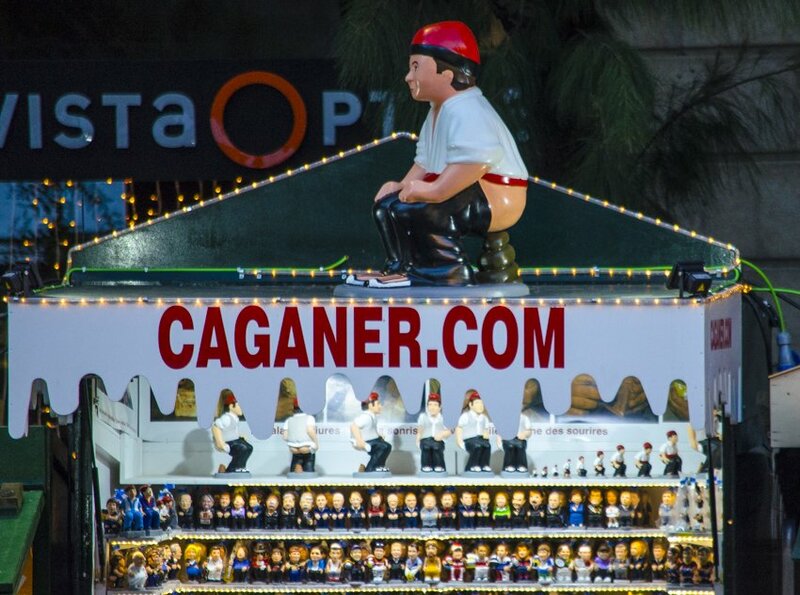 The Caganer has become so popular that nowadays they make them using popular politicians, sports people and entertainers. Another unexplainable Christmas “character” is the “Tió”. I was very excited to be part of this tradition the very first time I visited David’s family as it provided me with endless amusement. Luckily David has a young second cousin who is a true believer in the power of Tió. 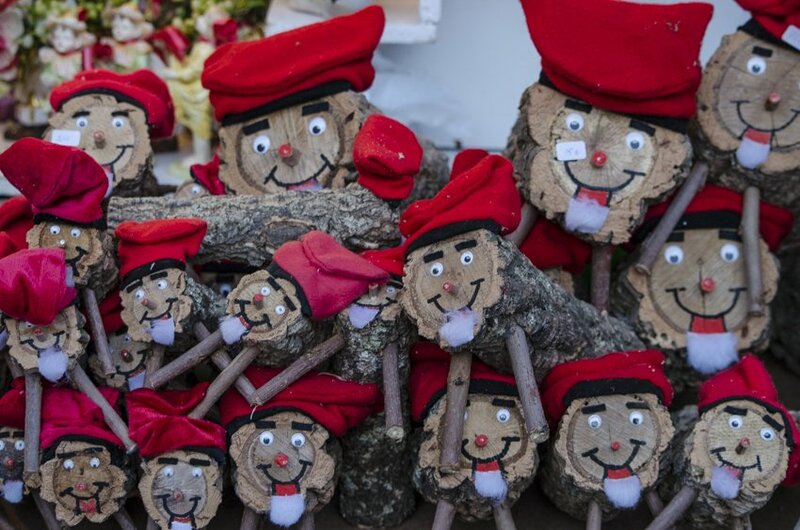 In short, you go out into the forrest and “find” a Tió (who wears a santa hat, it is meant to be the traditional Barretina worn in Catalonia, and has a painted face), you take your Tió home and put a blanket over him and you “feed” him every day (usually fruit and nuts). On Christmas Eve the kids pray for Tió to bring them presents and then they bash the crap out of the log with a stick. Miraculously, after the bashing and the singing of the Tió song (oh yes there is a song! ), the Tió poops presents. This process is repeated until the presents run out and then the final poop is the food that he was fed during the weeks leading up to Christmas Eve. Bizarre! Do you have any unusual traditions from you own culture or ones that you have experienced while travelling? Leave a comment and let us know :). Costa Brava is known as a popular holiday destination for northern Europeans. 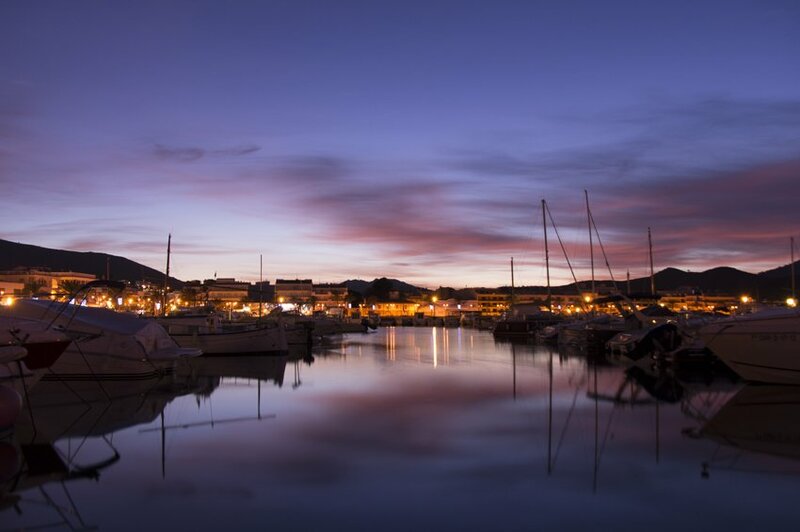 Apart from the beautiful, cute beaches, great food and friendly people, Costa Brava has been made famous by world-renown artists such as Dalí, Miró and Picasso who all lived or visited the area at some point. You will still find plenty of evidence of this artistic influence throughout the region. 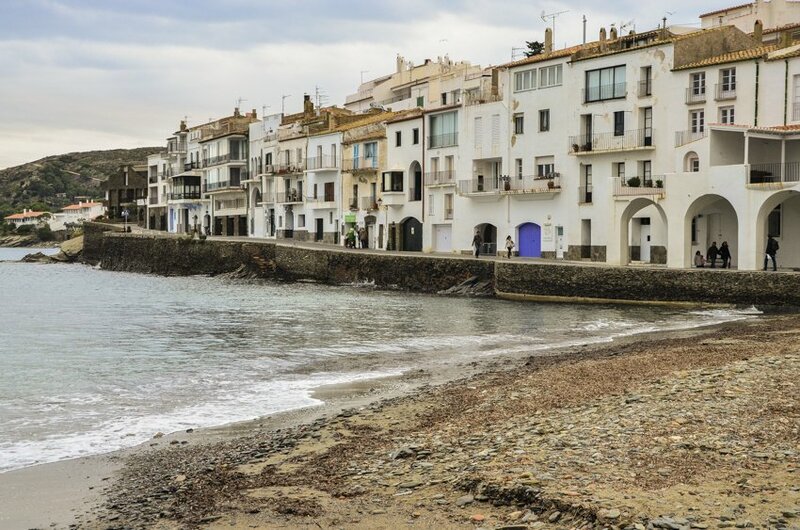 Cadaqués is one village in particular that is well known for it’s white houses and brightly coloured pottery. It was also a meeting spot for more infamous people such as Franco and Hitler in the past. 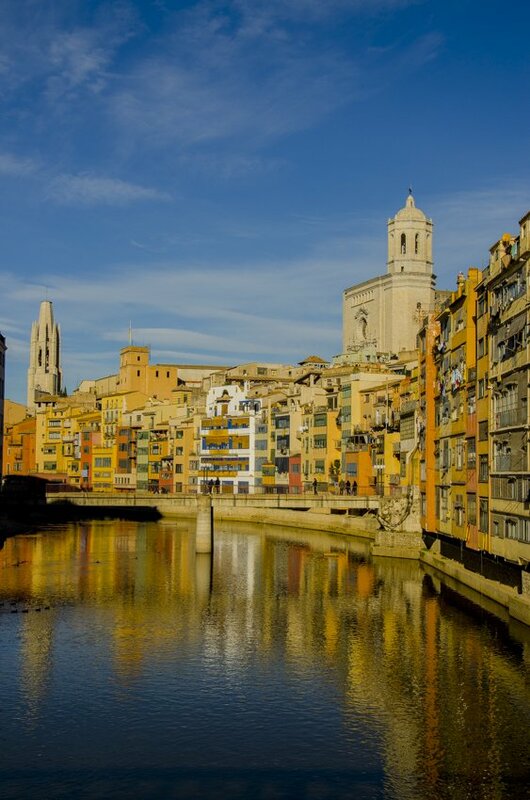 If you are in the area then you should not miss a visit to Girona, one of Catalonia’s major cities that has a long and turbulent history. The small laneways of the old walled city are a joy to wander around and explore. The colourful yellow and orange houses along the river make for great photo opportunities on a sunny day. 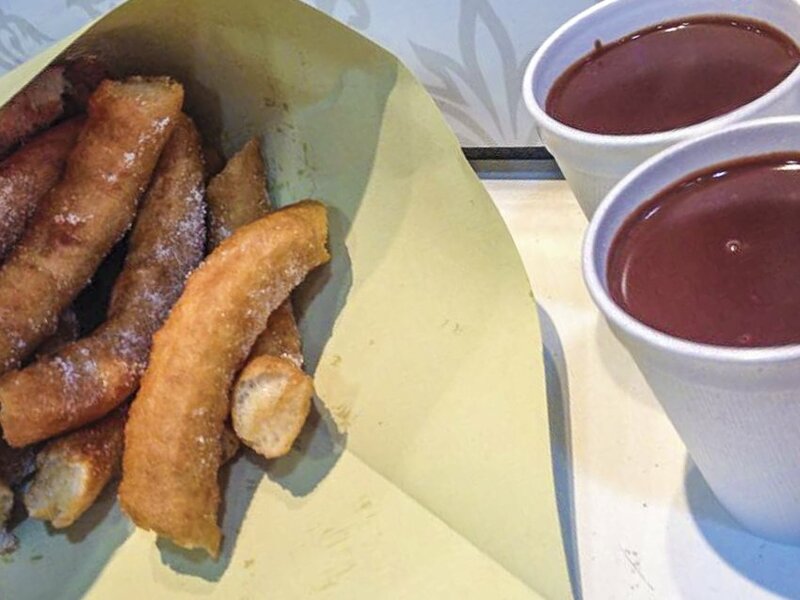 It is highly recommended that you try porras (a long type of doughnut covered in sugar accompanied by thick melted hot chocolate), like churros but even better – leave the diet at home! Find a good traditional churreria for the best porras. Porras is not unique to Girona but it was where I tried it for the very first time and will find it hard to go back to churros. Porras and thick, hot chocolate. Yummy! Catalan is a language that is kind of a mixture of French, Spanish and Italian. When David and his family speak Catalan to each other I do not understand a single word though do on the odd occasion somehow get the gist of the conversation. The fact that all people in this area grow up truly bilingual, learning Spanish and Catalan as their mother tongue, is quite impressive for this very monolingual little Aussie. 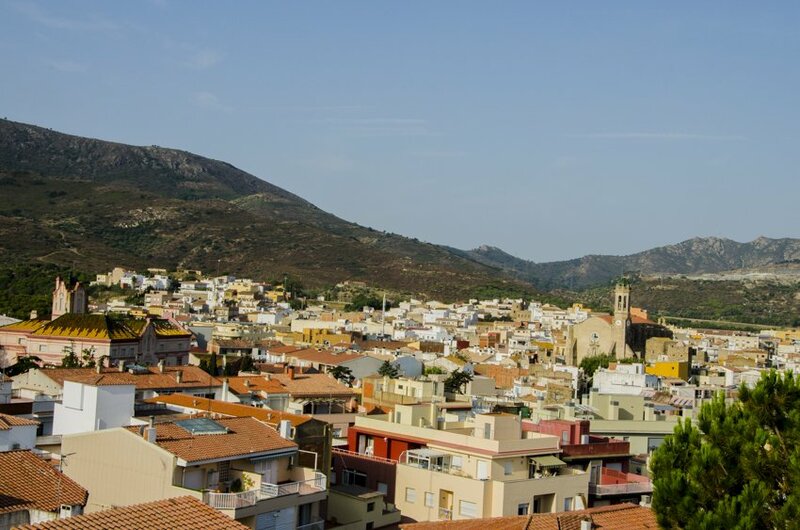 In addition, a large majority of the people living in and around Llançà are also fluent in French due to its proximity to the border makes it even more unique. After to listening to many a Catalan conversation one of the few things I have noticed is their inability to say good-bye quickly. It literally takes them 10 minutes to say good-bye whether it is in person or on the phone. There are a few minutes of vinga, adeu, vinga, adeu, adeu, vinga-ing and then they start a new conversation and then a new round of vinga – adeu starts! Llançà and the surrounding areas are also steeped in quite a lot of history. 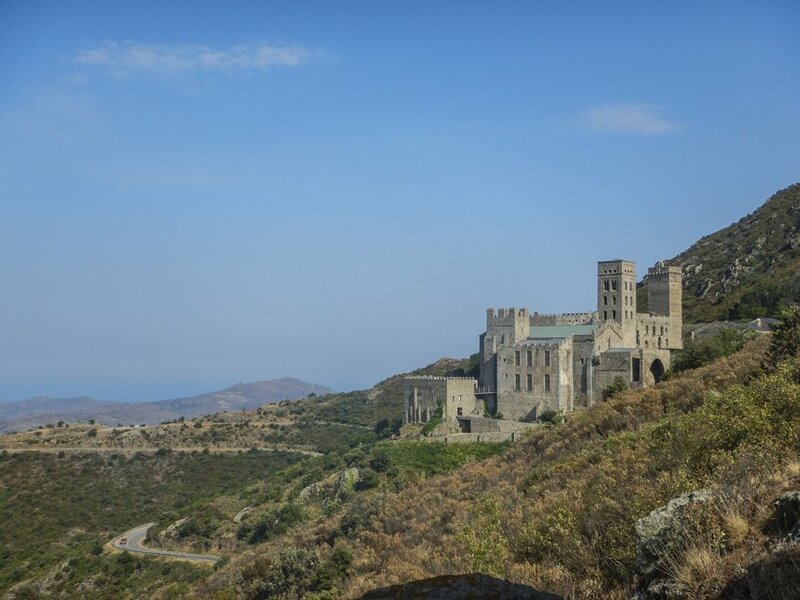 There are many old ruins of castles to visit and the crowning glory is the San Pere de Rodes Monastery. It is not only interesting on its own, it has superb views over many of the surrounding towns. 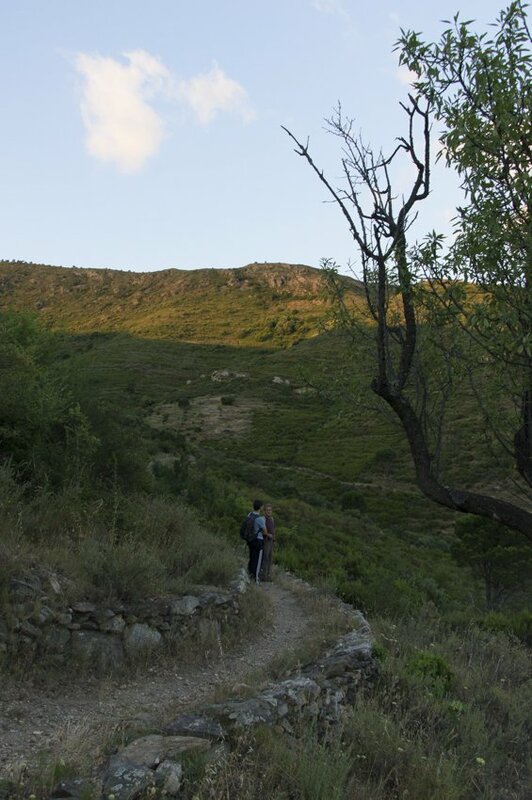 There are also many hiking trails in the area, including to the monastery. If you want somewhere a little less touristy that has that summery, seaside kind of feel with great food and wine and friendly people thrown in for good measure, Costa Brava is the place for you. If you want any more tips on travelling in the Costa Brava area then feel free to contact us by leaving a comment. Maybe you have discovered some other cool places in Catalonia, we would love to hear about them. Stay tuned to read David’s perspective of his home town…. Michelle already did a great job in her last post about her impressions as an outsider of my home town, Llançà. A great location on the Costa Brava (Spain) for culture, food, sport, history and relaxed experiences for all budgets. Now it’s my turn to add my insider tips. Ready? Steady? Go! 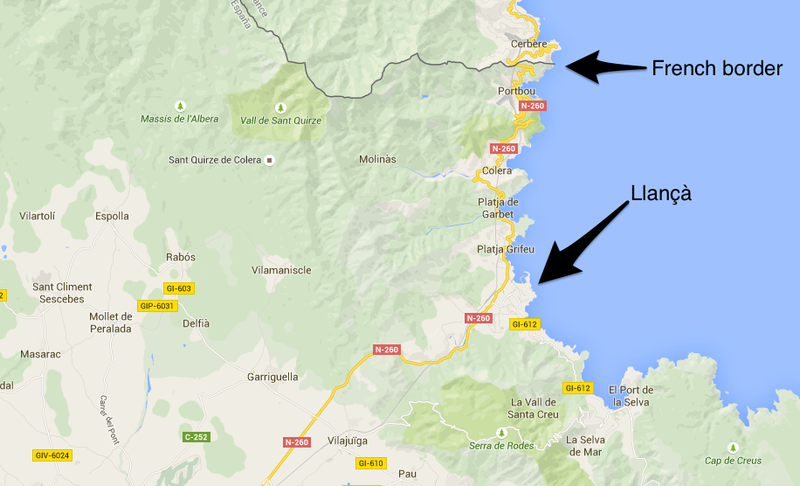 As said by Michelle, Llançà is almost on the border between Spain and France, on the Mediterranean side. As in any other border town in that area, the transit of people and goods for years back and forth between Spain and France has produced a rather special combination of cultures, traditions and especially languages. Due to its geographical location, French is a common language in the area surrounding border passes in the South of the Pyrenees. For its geopolitical situation, Spanish and Catalan are official languages in Catalonia and both considered mother tongues for many. 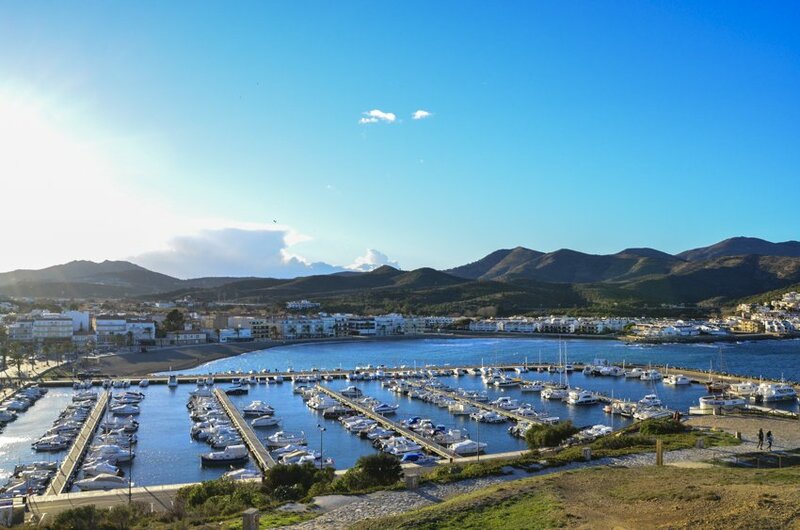 Add the fact that tourists from all over Europe and America have been visiting Llança since the early 1960’s, and you will easily have a couple of generations speaking 3 or 4 languages fluently in that area! After spending over 10 years living away from Llançà and coming back only for short periods of holidays, the sea is what I miss the most after my family, friends and food (in this order:) ). To those of you born close to the ocean or living by the coast, I am sure you can understand me. 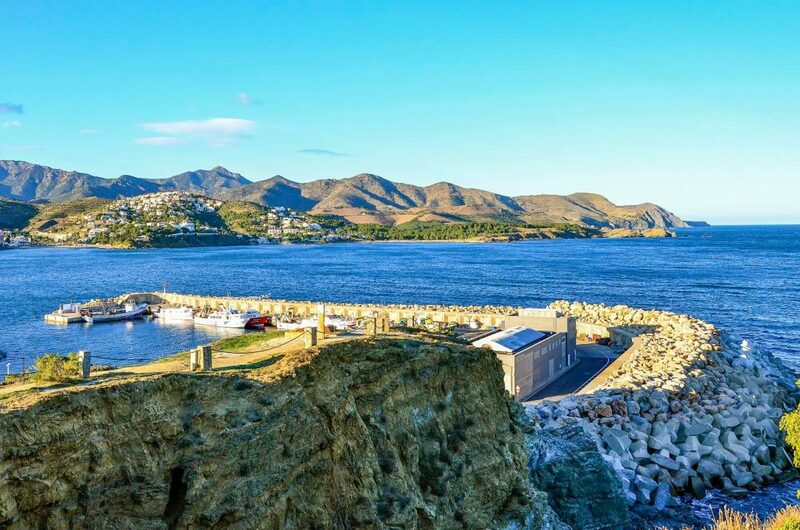 The smell, the breeze, the sound of the waves, the beach, the all-season availability of fresh seafood, the sunrise on the smooth horizon, the reddish sunsets… All that can be found in Llançà!. 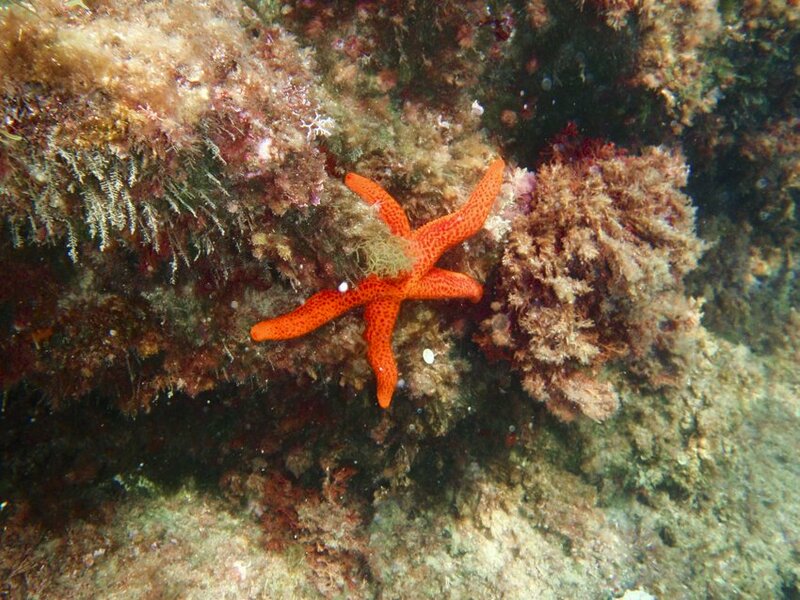 Diving and snorkeling are also awesome all along the Costa Brava, and Llançà is no exception. Even if waters are normally on the cold side until well into Summer, I cannot recommend enough to grab you mask, snorkel and flippers and jump into the water in the early morning for a relaxed experience with lots of marine underwater life to see. Commercial fishing is an important activity for the economy of the village. Therefore, if you happen to find the water way too cold for your taste, you can always go and visit the daily fish sale at the “Llotja” of the harbor when the fishermen boats arrive in the afternoon. If you are more of the trekking type, that area of the Costa Brava happens to be just where the Pyrenees meet the Mediterranean sea. And even if those mountains have suffered several bush fires in the past decades, they still have so much to display. In fact, one of my favourite activities when I am back home is to go trekking with my dad while he stops every two steps to draw my attention to a plant, a tree, an old construction… He happens to have an encyclopaedic knowledge of those mountains and I admire him for that. Michelle and I call it the “Papa F. effect”, with all the love of the world, of course :). And sometimes, after so many stops we even make it to the monastery of St. Pere de Rodes and back in some 12 hours!. It is no secret that eating and drinking is a very popular activity in Spain. Tapas and sangria are known and loved worldwide! Michelle already noted this fact and presented to you some of her favourites here. Escudella. A quite filling soup with chicken, pork and veal broth with cabbage, rice and small noodles common on every Christmas table. Mongetes amb butifarra. A tipically catalan sausage (“butifarra”), barbecued and with a side of boiled or salted white bean dressed with olive oil. Bacallà amb xanfaina. Fried cod fish cooked in a sauce with pepper, onion and tomato. If you are still hungry, what about a dessert? Pomes rellenes. Oven-backed whole apples with removed core and stuffed with the filling of choice. 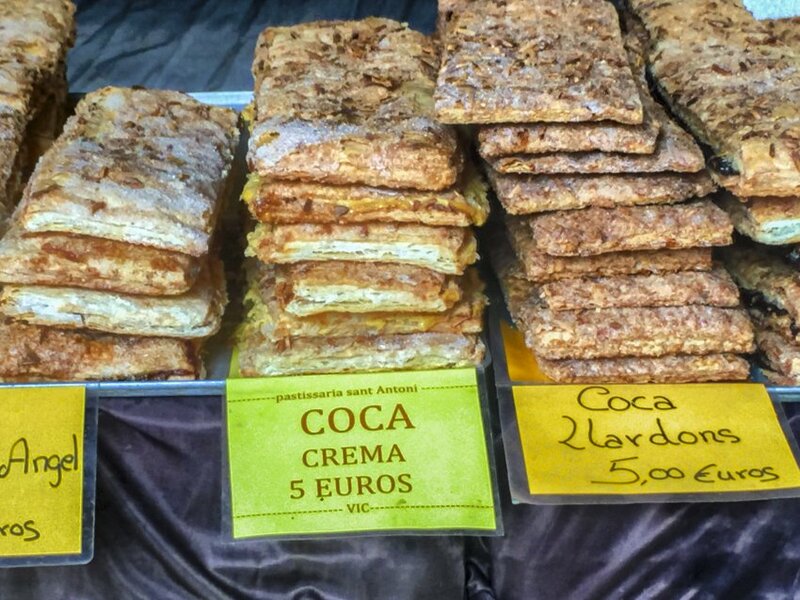 Coca de Llardons. This one is more an any-time snack ;). Milfeulle pastry with crunchy friend pork fat (“llardons”). Gemma at Cinamon Girl has a whole post on this desert with recipe here, just in case you feel adventurous and want to try. Brunyols. Doghnut-like type of pastry fried and covered in sugar. And I could go on an on and on… In any case, those diet-conscious out there please proceed with caution :). In summer time, it is not rare to see full local families preparing paella (another recommendable dish with as many variations as cooks) by the sea or in the woods. Celebrations in Spain happen in big groups of family and friends, also in Llançà. And that can get noisy, believe me :). I can remember the first time Michelle spent a Christmas in Llançà, and being surprised to see how everybody was understanding each other even if multiple loud conversations where going on hahaha. That’s one of the things I didn’t realize until she came with me to my home town. Since then, I find it hilarious! Do you want to know more? Did I miss anything? Just hit the ‘Leave a Comment’ link at the top of the page and let me know! 5 Comments on “Seeing ones home town through two different pairs of eyes”. Join the Conversation Here! What a wonderful scenic village and steeped in so much interesting history. Great photography too. Thanks for your comment. I would definitely recommend that you visit the area. Merci Michelle. Photos et commentaires TOP. David va écrire un autre post avec plus de photos et d’informations sur Llansá très bientôt.